Have you stumbled upon iDoodleCard? I literally stumbled upon this app and found it to be a good, visual motor app that is Free! 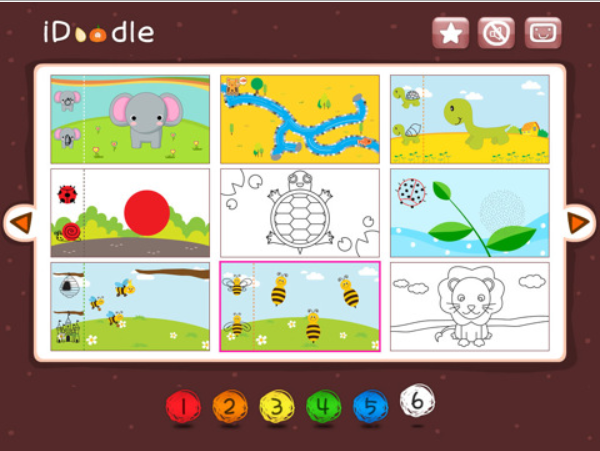 iDoodle variety of visual motor activities for preschool and early elementary aged students. This is a good pediatric OT app for the kids who are working on basic visual motor and visual perceptual skills! Focused on drawing activities, iDoodleCard provides 54 different drawing activities that you can easily swipe to get to the next or go to page views to choose one of nine activities on each page. Activities include mazes, coloring, drawing animals and things with shapes and free draw. The draw tools are six primary colored markers and an eraser which are all large and easily accessible. A save tool that allows you to save your creation within the app is provided. For a print copy, you could do a screen shot by pressing the home and power button simultaneously which will send a photo to your photo album for archiving (assessment data) or emailing the creation for print from a computer or via e-print methods which ever is available to you. Music is available to turn on or off when working in the application. I have enjoyed using Ed Emberly’s Big Books (Orange, Red, Green, etc books) or other basic step by step drawing books to work on drawing, position in space and visual motor skills with primary aged students who could not draw recognizable pictures in art or the classroom when authoring. Some of the activities remind me of those activities that kids like to do and help them break down the visual task. I am sure there are many other apps out there for step by step drawing instructions to check out if those are therapeutic interventions you use with your students. Speaking of doodling – have you read the OT Advance article on doodling by Susan Schriber Orloff, OTR/L? Check out Doodling: A Boost to the Brain , I thought is was an interesting, quick read and a good reason to doodle! Are you using any styluses for drawing or writing for yourself or your kids? Or have you transferred online drawing activities or worksheets using your iPad or iPod (kinda small but possible)? This entry was posted in Apps for OT's, Fine Motor Development, iPad, iPod, Occupational Therapy, Visual Motor, Visual Perception and tagged apps for fine motor, apps for visual perception, iPad apps, occupational therapy, OT Apps, Visual motor apps. Bookmark the permalink.